SYSCOM INTERNATIONAL LLC, is one of the fast growing Value Added Distributors in IT and Office Automation products, for Middle East and Africa (MEA) markets. Established in year-2003, SYSCOM INTERNATIONAL has become the most dynamic companies in the region serving many active customers. 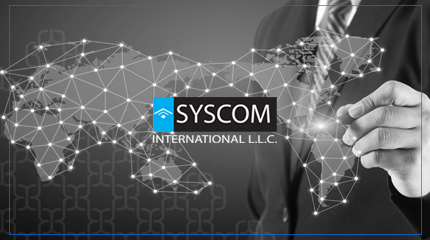 SYSCOM INTERNATIONAL combines extensive knowledge of the local regional markets it serves with a strong international team bringing value to both its vendors and customers. We are offering to our customers a unique combination of the best quality products, prompt deliveries, warranty service and technical support with strong local team and international expertise. Professionalism is what makes Syscom International a top partner in business. We cultivate ideas and analysis that drive new perspectives, products, solutions and new paths of growth. Our aim is our customer satisfaction and we do not step back after providing the client with the requirement. We are there for after sales support and maintain our relationships with our clients in the very long run. Every customer is unique, every requirement is different. There is a saying – “practice makes man perfect...., at Syscom International we say our “Hard work will make your life perfect”. We understand your business and leverage our knowledge into your business and serve you with world class solutions incorporating just the latest technology. With teams of experienced professionals and a suite of sophisticated technological platforms, we do proper planning, execution, development and implementation of the best solutions for our customers. Syscom is one of the fast growing Value Added Distributors in IT and Office Automation products, for Middle East and Africa (MEA) markets. Established in year-2003, SYSCOM INTERNATIONAL has become the most dynamic companies in the region serving many active customers. Combines extensive knowledge of the local regional markets it serves with a strong international team bringing value to both its vendors and customers. As a value-added distributor, if we cant show how a manufacturer can help one of our resellers grow its top-line and bottom-line results we are not doing our job, we are not adding enough value. The manufacturer will go somewhere else and the reseller will choose a different product. Our role is to articulate the value of the manufacturers products to the reseller channel, and provide the reseller with the knowledge and the tools to successfully market and sell the products to their customers. SYSCOM INTERNATIONAL LLC, is one of the fast growing Value Added Distributors in IT and Office Automation products, for Middle East and Africa (MEA) markets. PO BOX : 89382, Bur Dubai, Dubai, United Arab Emirates.